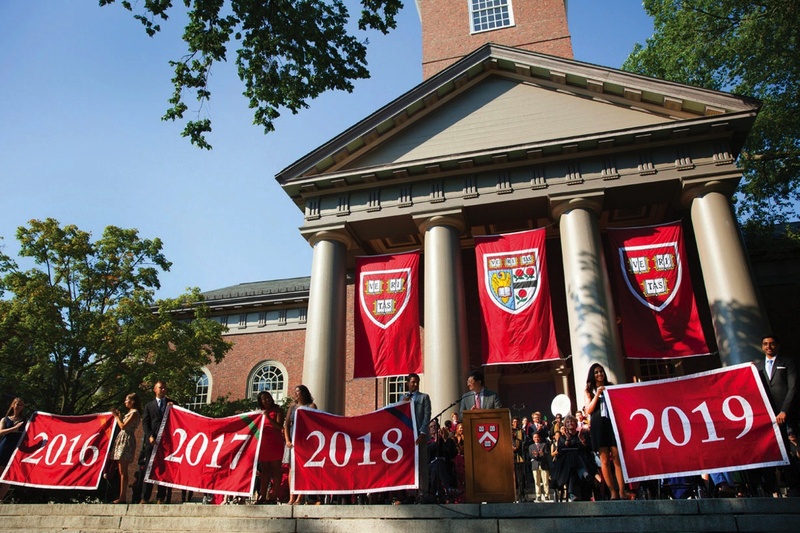 At Freshman Convocation, Harvard College dean Rakesh Khurana reminded his new charges, “You were already admitted to Harvard, and you all belong here,” so they could relax and get beyond application-oriented résumé-building. Doing Harvard “the right way,” he suggested, involves intellectual exploration and being willing “to connect with others different from you.” Holding forth the prospective of a transformative Harvard education, Khurana hoped “your experience of college will be one not of showing the world what you can do, but, rather by discovering what you want to do….” Full convocation coverage appears at harvardmag.com/convocation-15. Harvard’s top-ranked economics department has suffered a brain drain, losing five full professors to Stanford’s department and business school in recent years. And the Crimson department has failed in recent attempts to recruit Cardinal prospects—developments notable enough to rate coverage in The New York Times (“The Star Rising in the West,” September 13). Goldman professor of economics David Laibson, Harvard’s chair, told the Times, “Stanford’s keen interest in recruiting Harvard faculty is testimony to our strength,” but the losses sting: microeconomist Susan Athey; education expert Caroline M. Hoxby; econometrician Guido W. Imbens; behavioral economist Alvin L. Roth; and, this term, Raj Chetty, acclaimed for work on poverty and opportunity. Roth is a Nobel laureate; Athey and Chetty were John Bates Clark medalists, the top prize for work in economics by a scholar under the age of 40. Whatever the reasons (access to Silicon Valley’s innovation economy and big-data capacity, proximity to the Pacific region, attractive offers of spousal employment, consulting opportunities, the weather), the momentum has come to administrators’ attention. Responses may include a concerted recruiting effort to bring new members to the department, and finding resources to reconfigure and augment its quarters, in Littauer, which professors have long complained discourage collaboration and increasingly are ill-suited to large-scale, data-intensive research projects. In 2014, when the University announced that it would impose coinsurance and deductibles on faculty and nonunionized staff members’ health-insurance coverage, in an effort to rein in costs for employee benefits, it encountered sharp criticism from many professors. That prompted President Drew Faust to disclose data underlying the decision and to promise to revisit benefit offerings this fall, for coverage during 2016. The result, communicated to the community in late August and mid September, is an additional, higher-premium health plan, for participants who wish to eliminate the risk of incurring deductibles or coinsurance charges. The progressive features of Harvard’s health offerings (premiums graduated by income cohorts, and reimbursement for out-of-pocket costs) were made more so—a move perhaps intended to appeal to unionized employees, whose contracts, being renegotiated, still provide them health plans without the cost-sharing features introduced in 2014. None of the new changes will likely lessen the escalation of health costs in the expensive Greater Boston market; indeed, Harvard informed employees that premiums will on average increase 7.3 percent in 2016, more than reversing the reductions realized this year as a result of the shift of costs from the insured portion of their coverage to coinsurance and deductible payments. Full coverage and analysis is available at harvardmag.com/benefits-15. An 80-institution Coalition for Access, Affordability, and Success—including all the Ivy League universities and their peers, many of the nation’s selective liberal-arts colleges, and numerous public institutions—is unveiling a free portfolio-based suite of digital tools for high-school freshmen, sophomores, and juniors in an effort, it said, to “recast the college admission process from something that is transactional and limited in time into a more engaged, ongoing and educationally reaffirming experience.” The transactional process is the default mode in this era of plunging admission rates, multiple Common Application submissions, test-tutoring, and other maladies (see “What Ails the Academy?” page 64). The member institutions “also hope to motivate a stronger college-going mindset among students of all backgrounds, especially those from low-income families or underrepresented groups who have historically had less access to leading colleges and universities” (because they lack good guidance counseling and the means to secure proprietary private help). The digital tools are intended to “reshape the process of applying to college as the culmination of students’ development over the course of their high-school careers, reducing the unfamiliarity of the application and leveling the playing field for all students.” The application portal will enable each institution to tailor its essays and other individual requirements as well. And because public coalition members have need-based financial aid for in-state residents, and private institutions are committed to meeting admitted applicants’ financial needs in full, the coalition obviously has an ambitious social mission, and perhaps even the intent of pushing back against teaching-to-the-test in primary- and secondary-school curriculums.